Over the past two years Coogan has been working on a series of six 'yellow' performances; Yellow, The Yellow Mountain, The Fall, Cutpiece, Yellow-expanded and finally, as part of the Ulsterbank Dublin Theatre Festival, Coogan will present the exploritary Yellow-Reperformed in collaboration with five other performers. At the Kevin Kavanagh Gallery for the first time we can see artworks from the series together. This exhibition of photographs and video is made to accompany Coogan's final work of the series; Yellow-Reperformed. These yellow works have been shown and performed as widely as, The Oonagh Young Gallery, Dublin; Artists Space, New York; Trace Gallery, Cardiff; The Kevin Kavanagh Gallery, Dublin; The Whitworth Gallery of Art, Manchester; The West Cork Art Centre, Skibereen; VISUAL Centre for Contemporary Art, Carlow; The Dingle Film Festival, Siamsa Tire, Tralee; The Plymouth Art Centre, Plymouth; Tulca 09, Galway; Point d'Impact festival, Geneva. 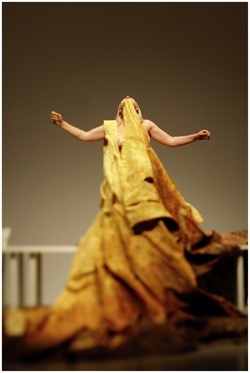 Amanda Coogan is a practitioner of live performance at the most innovative and dynamic point in the Visual Arts in Ireland, and is a practitioner who pushes the boundaries of Performance Art internationally. Coming straight from the lineage of Joseph Beuys , Marina Abramovic and Alastair Mac Lennan, Coogan creates non-text based live performance steeped in the image. Ireland has a vibrant and internationally recognised practice in live performance from the visual arts. Many reasons have been cited for this including Alastair Mac Lennan’s practice and Samuel Beckett work. Coogan’s practice is to the fore in Irelands current international recognition. The centrality of her practice is durational live performance where powerful live events are fundamental to her videos and photographs. Her expertise lies in her ability to condense an idea to its very essence and communicate it through her body. Coogan’s recent practice has been concentrating on the longitudinal durational performance presented as living installation in the gallery.